A rubber tapper walks to work on a plantation in Rayong, a province in eastern Thailand. I went back out to Rayong this week for another round of photography of workers in the Thai rubber industry. Rubber is a globally traded commodity and rubber prices are depressed to record levels around the world. Thailand is the world's leading 2nd exporter of rubber (and until recently was number one), only Indonesia sells more rubber internationally. A tapper cuts a tree to start the flow of latex. Rubber prices have fallen another five percent since I was in Rayong in September. It's now selling in Thai spot markets for about 48Baht (about $1.45 US) per kilo. The cost of production however has not fallen, it costs Thai rubber farmers about 62Baht (about $1.87). You don't have to be a math major to realize that you can't make a living when you lose .42¢ on every kilo of the product you make. A worker in a "middleman" business that buys rubber from farmers and sells it to processing plants stacks rubber sheets. Rubber is grown on everything from small mom and pop farms worked by couples and their children to sprawling plantations that employ hundreds of people. There is a huge infrastructure to support the rubber industry in rubber growing regions. There are so called "middleman" businesses that buy rubber from farmers and resell it to factories. There are large factories that process rubber and small cooperatives that educate farmers and try to help them get better prices. Driving through the acres and acres of ramrod straight rubber trees, it's hard to envision this part of Thailand without the rubber industry. The low prices are affecting farmers in many ways. Some have left the business and taken jobs in Bangkok or nearby towns. Small farms that used to hire a few workers have laid off their workers and started working their families themselves. There have been reports of a rash of suicides of rubber farmers unable to support their families. Many businesses in the rubber industry are trying to produce and sell rubber as quickly as they can. Since prices go down almost every day, they're not holding rubber in inventory. They tap the trees, process the latex and move it as quickly as they can, fearing rubber that sells at 48Baht per kilo today may sell at 47Baht per kilo tomorrow. Workers on a large plantation pour liquid latex into tanks that pump the latex into rubber sheet making machines. 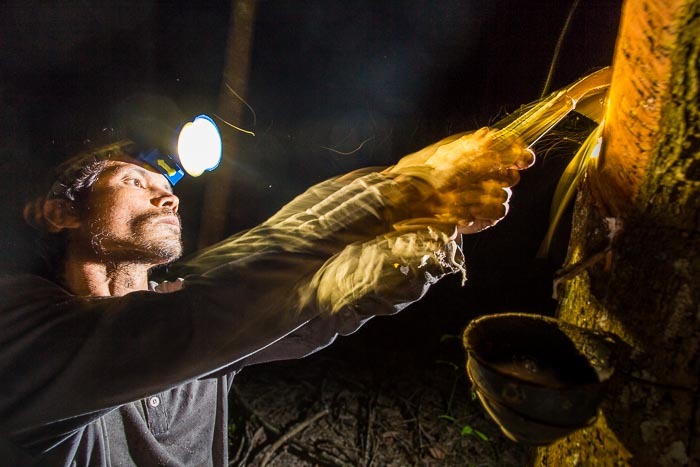 Rubber producers have little control over the prices their products sell for. The leading customer for Thai rubber is China. The Chinese economy is slowing down, reducing the demand for Thai rubber. 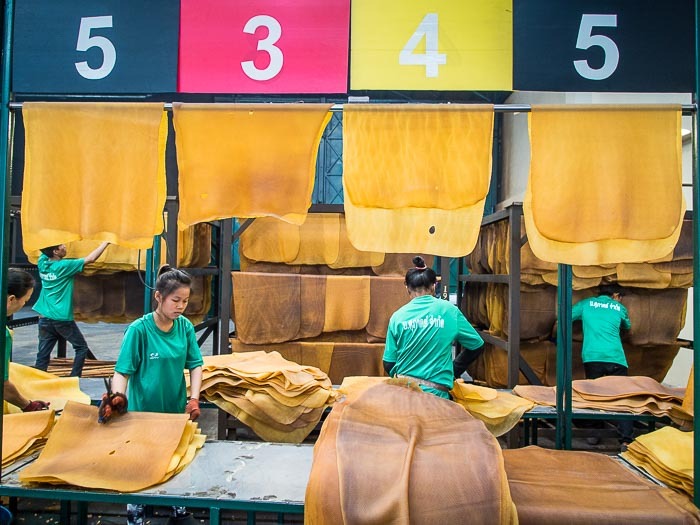 At the same time, China is starting to produce its own rubber, in competition with Thai rubber. New rubber plantations are also coming online in Vietnam and even in existing rubber powerhouses like Thailand and Indonesia. Rubber prices were trending up through the 2000s and peaked in 2011 at 190Baht per kilo. People planted new rubber hoping the good times would continue. 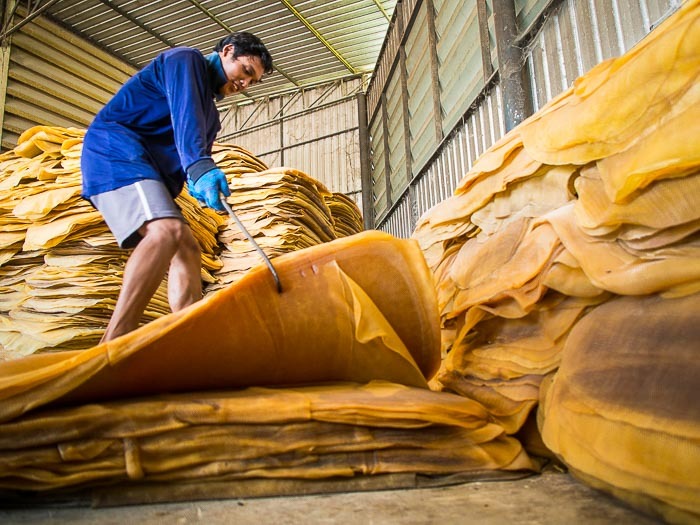 It takes seven years for a rubber tree to produce latex, many of the new plantations are coming online as prices bottom out, leading to an increase in supply at the same time there is reduction in demand. 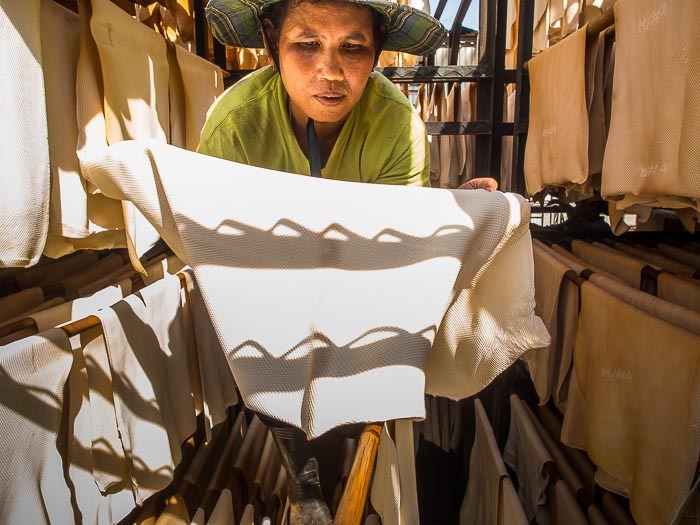 A worker hangs rubber sheets to dry at a plantation in Rayong. Thai rubber producers are hoping the government will intervene to prop up prices but the government so far has been reluctant to directly intervene. Rubber producers are also taking direct action to increase their prices. Currently, most of the rubber grown in Thailand is exported to China and other manufacturing countries where it is turned into consumer products or put to industrial uses. Thai processors are exploring ways to use their rubber at home - they're starting to manufacture rubber products like floor mats and swim fins. Quality inspection stations at a processing plant. The numbers refer to rubber grades. 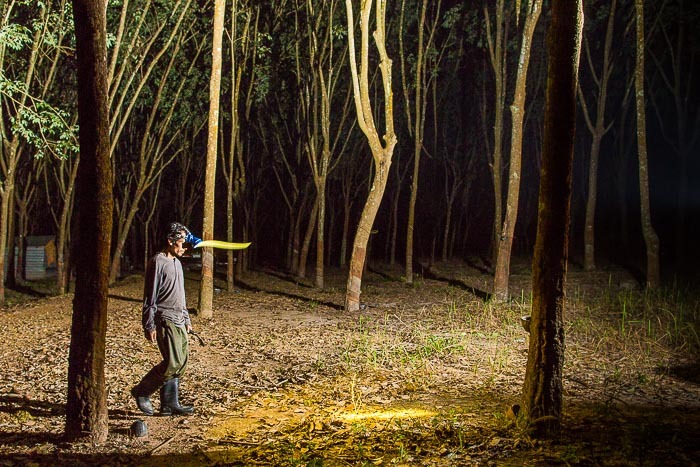 The only real solution to the crisis in the rubber industry is to stabilize supply and demand but no one knows when that will happen or how long farmers and others in the rubber supply chain can hold out. 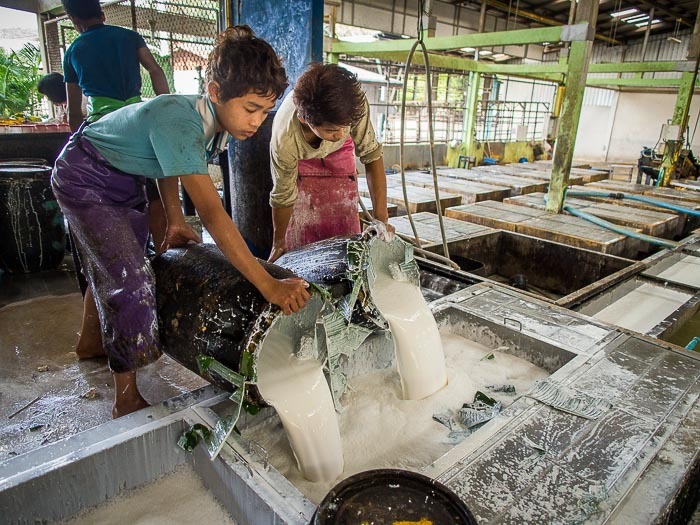 I have more photos of the rubber industry in my archive or available from ZUMA Press.